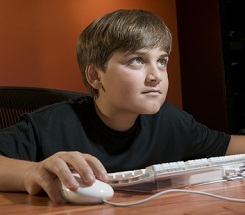 A 2009 study that investigated the way in which digital play may be used to advance children’s learning and health stated that the average child starts playing video games by age six. That statistic is definitely out of date. Want proof? Check out this 1-year-old child attempting to digitally manipulate a magazine (http://news.yahoo.com/blogs/cutline/baby-thinks-print-magazine-broken-ipad-201148361.html). Now imagine her video game prowess at three. Some teachers and parents disapprove of the ubiquity of video games, fearing that they take time away from serious study and appealing extracurricular activities, or even promote poor behavior. While those are valid concerns, video games are not going away, so educators must learn how to steer children toward video games that challenge their mind and body, and improve their self-identity and social skills. • Improved Diet – Multiple engaging video games teach students how to become better consumers of food. For instance, Food Fury—aimed at 3-5th graders—promotes better food choices and explains portion control. And the computer game RightWay Café, which teaches nutrition and weight management, seems to improve the diet of students even after they have finished playing the game. • Physical Fitness – There are many games that promote activity and help fight obesity. The Wii system is famous for getting kids, and even adults, off the couch and into the action. But other such games also make a difference for students. Humana Games’ Horsepower Challenge had fifth and sixth graders compete against members of Congress to power up cartoon horses in a race across the country, by measuring the real steps each individual took using a pedometer. • Memory – The many puzzle-based video games on the market enable students to build their “working memory,” which gives them a leg up in studies and helps them achieve success later in life. • Vision – A study from the University of Rochester found that games with intense action increase the real-world vision of participants. Gamers became 58% better at distinguishing subtle shades of the color gray, part of human vision that scientists have long thought was impossible to improve. • Hand-Eye Coordination – Even some of the most vilified games can bestow some benefit for their users. First-person adventure games, very popular among boys and young men, teach fine motor skills and the ability to time events and precise movements. In fact, a 2003 study at Iowa State University established that these kinds of video game skills could translate to surgical success. They found that doctors involved in laparoscopic surgery who spent at least three hours a week playing video games made roughly 37% fewer mistakes and performed tasks 27% faster than those doctors who did not play video games. In addition to encouraging students to play video games to gain new skills, teachers can also introduce students to game-making platforms that allow students to build their own video games, which introduces them to a whole new slew of learning behaviors. Sites that support the creation of video games by children cultivate critical learning skills that can assist students in today’s technology-based society. Designing games improves students’ writing and storytelling ability, their concepts of cooperation and sharing, their motivation for STEM (science, technology, engineering and math) learning, their systems thinking skills, and their appreciation of art and aesthetics. Below are a few free game-making platforms. See which ones appeal to you, and might be worth working into your own curriculums. This online game lets students create their own games, play others’ creations and vote on their favorites. These simple games teach strategy and planning. Here students first play games that others have created to earn the tools necessary to design games of their own. This site fosters creativity and collaboration. Students can create games via PC or Xbox using this simple visual programming language. Teachers can use this language to teach storytelling and basic literacy in digital media to their students.